Brother Herat Mondol, O.M.I. is a pioneer Missionary Oblate. He is the first Oblate from Bangladesh to study for the priesthood in the United States. But becoming a trailblazing Oblate was something Bro. Herat never intended. In fact, his introduction to the Oblate world was simply good luck. Brother Herat was staying at a youth hostel in Bangladesh. He happened to see an Oblate magazine lying on a table. The magazine was written by Bangladesh Oblates and scholastics, and talked about how the Oblates work with the people on the outskirts, people in the tribal communities. Brother Herat’s journey to the priesthood can be traced to a family tragedy. His older brother died in a drowning accident. His parents prayed often to God to bless them with another child, and promised God that they would encourage that child to consider religious life. Two years later Bro. Herat was born. Brother Herat grew up in a devout Catholic family. His parents never pressured him to become a priest, instead focused on ensuring that their son had a solid Christian upbringing. 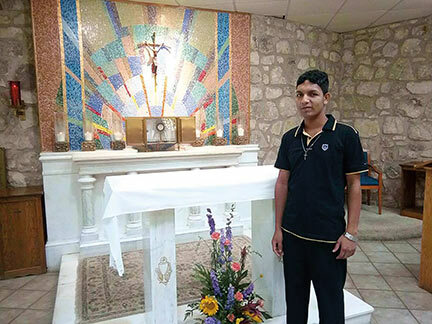 Brother Herat didn’t even know about their promise to God until after he joined the Oblates. The Oblates have about 30 priests and brothers working in Bangladesh. Most of their work is in the rural areas, ministering to tribal people. Because the congregation is small, Bro. Herat was sent to Sri Lanka to discern his calling further with the Oblates. After two years in Sri Lanka, he returned to Bangladesh for two more years of philosophy studies. Then he got word to pack his bags because he was headed to the other side of the world to study at Oblate School of Theology in San Antonio, Texas. In San Antonio Bro. Herat is truly part of an international community of Oblate seminarians. He lives, prays and studies with young Oblates from the United States, Mexico, Nicaragua, Zambia, Kenya and India. “I am truly blessed to live in such an international community with my fellow Oblates,” said Bro. Herat.